KHSU is a community-supported, non-commercial public radio station, licensed to, supported by, and located on the campus of Humboldt State University in Arcata, California. We broadcast a diverse mix of programs to a population of about 135,000 people throughout Northwest California and Southwest Oregon. Thanks very much for listening to and for visiting khsu.org. 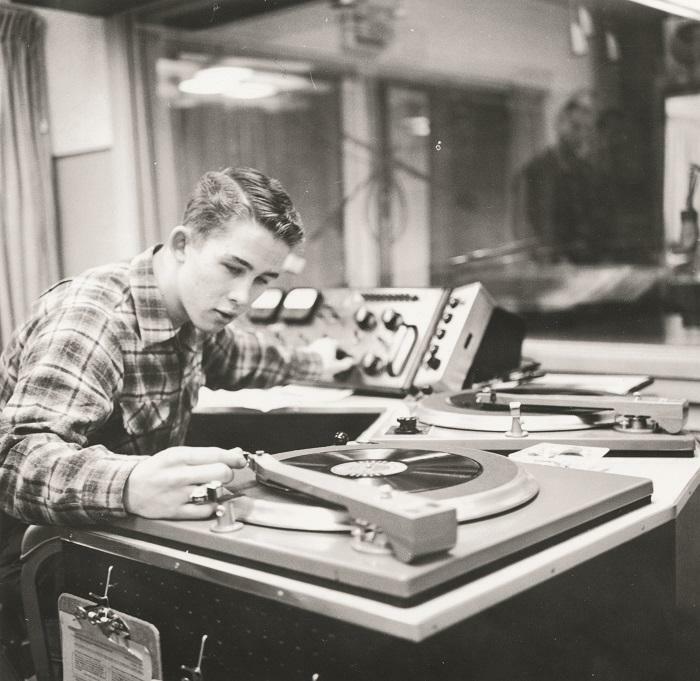 Student deejay drops the needle at the KHSC studios circa 1960. "Diverse Public Radio" and "KHSU" are service marks of the Board of Trustees of the California State University. In addition, KHSU is licensed to Humboldt State University (HSU) and follows the policies and guidelines of the university, including the university's commitment to diversity. HSU has a longstanding commitment to institutionalizing diversity, equity, and inclusion in all areas of its work, including KHSU. KHSU reflects a high level of diversity in its staffing and programming. KHSU employees, interns and volunteers are gender-diverse and include persons that are of African-American, Native American, Hispanic and Asian descent. KHSU also produces local public affairs programming focused on women's issues and LGBT concerns, and music programs that feature music from the African-American tradition, various world music traditions, and a bi-lingual Hispanic music program. The KHSU Community Advisory Board also values diversity, equality, and inclusion in its membership. Equal opportunity in CAB membership shall be afforded to all qualified persons, and no person shall be discriminated against. The CAB will strive for its members to reflect diversity in such areas as; age, gender, sexual orientation, race, culture, ethnicity, profession, and artistic expression, among others. (Ref: CAB Bylaws: Article III, Section A - 1 [downloads pdf]).